My Weblog: Grey/Black Wednesday. Scary Saturdays. I quite agree! Christopher Ecclestone was a very hard act to follow, I think that David Tennant has done a great job! How scary was doctor who! I found myself wanting to crawl behind my Dad's chair just like I used to as a child. Is that fabric homemade? Very cool. I must say that as a foreigner living in England it was quite amusing to see how anticipated Dr Who was. I think I thought it was a little bit silly.. but now I kinda like it. ;-) And I like David Tennant too. Absolutely agree about Dr Who - wonderfully scary stuff on Saturday. I'm not sure I could have coped with that particular episode as a child - I was terrified of the Cybermen when I was small - but a nail-biting, on-the-edge-of-your-seat storyline nonetheless. Is that dalek fabric? a sketch? wow- I LOVE it!!! i need to get me a stamp like that!!!! Amazing! Very, very cool! I'm surprised that the US is showing such up-to-date episodes - last week was the super-intense "change" episode. I'm going to miss Eccleston, though. We are fans of the "new" Doctor Who, tho we haven't yet seen the 2nd season (and missed the Christmas special). My husband picked up the first (Eccleston's) season a few weeks ago and we tcuked in to watch a few episodes with our sleepy 3 year old. We're usually quite lucky: the little guy almost always falls alseep after about 10 mins, so we usually don't bother censoring more scary films from him. Not this time! He LOVES Doctor Who. He runs around with a little blue cup claiming it's the Tardis and that Docker Who and Rose Tywer are inside and the blue light is flashing. Sometimes he even sits playing calling out, "ex-ter-mi-nate" over and over and then proudly tells me that what the Dalek says. Luckily, he doesn't get frightened so much as purely fascinated. He has such a limited understanding of what scary is supposed to be! I bet he would love Dalek sheets like those above! 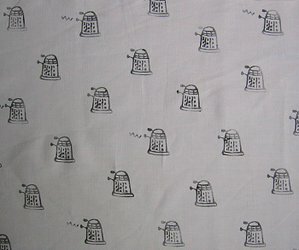 Wow - Dalek fabric! I discovered Doctor Who in college; I'd stay up very very late on Saturday nights watching the US PBS station. It'll be great to see the new Doctor. I *can't* imagine anyone as good as Eccleston - major crush on that doctor, I tell you. I'll take your word for it about David Tennant. Can't wait to see the next series. I love, love, love Dr. Who, and I don't care who knows it!!! I was never allowed to watch Doctor Who as a kid because it gave me nightmares. Then again, so did HR Puffenstuff! what have you got planned for it??? Oh no, no more Christopher Eccleston? I will have to wait and see if this new Dr. Who passes muster. Dr Who! Now that's a blast from the past (childhood spent in New Zealand! I wonder if we get it here in the States? In any case, that is some very cute fabric! Haven't dipped a toe into the New Who pond, but Tom Baker will always have my heart. Love it! I think the Daleks are my favourite character from Dr.Who, especially when they say in their metallic voice, ex-ter-min-ate, ex-ter-min-ate! My dad was so into it and still is I'm sure, so we'd watch it together. The theme music is still in my head after all these years of not hearing it. Oh how it has made an impression! There must be something about fathers and daughters watching Dr.Who together huh? I LOVE DR WHO! We (in Australia) are still waiting for more of the David Tennant ones ... I didn't think I'd survive the demise of Christopher Eccleston, but DT works just as well. If that's Dalek fabric you've created yourself, you should sell it! I'd buy some (for the kids, truly). okay, I am afraid. very. I haven't the slightest idea of what you are all talking about...but then again I stopped watching the tube which is pretty scarey in and of itself. So what ink did u use?, asks the crafty copier. I'm gonna put my monkey on some fabric too. Oh good! I'm so relieved to hear that David Tennant is up to the challenge -- it was hard to hear that Christopher Eccleston had left after only one season. (I remember sobbing unconsolably as a child when Tom Baker regenerated into Peter Davison, whom I could only think of as Tristan from "All Creatures Great and Small" and not as the Doctor at all). I love David Tennant. Besides being an absolute dreamboat, he's a darn good Doctor. David Tennant, I have indeed warmed to him. one more comment, since reading all the comments brought tears to my eyes, " are you my mommy...."
now that one totatllly freaked me out!!! Oh, I accidentally found you and there is Dalek fabric!!!!!! Oh how wonderful!! I pleaded with the ABC in Australia till they told me we will have the Christmas special on July 8th here!! I will be wearing my new Dr Who cardi and my pyjamas I think!!! Dr Who crazy it the right kind of crazy!!! Speedy Stamp. What is this Pray? Please tell. YOur fabric is great and I wnat to know a speedy stamp!! I've searched for this Dalek stamp and can't find it.. help me please, my husband is a huge Dr. Who fan and especially the Daleks. I would love to stamp up some Dalek fabric and make him a cool dalek quilt. Thanks so much. ps. oh, sorry so carried away with the love of your blog I forgot to mention how much I enjoyed it. If you like Dalek's, you should check out Angry Chimp-www.angrychimp.blogspot.com. He's got a thing for robots. Daleks! I haven't thought about Dr. Who in so long... Tom Baker was on when they were showing it on PBS late on Sunday nights. Over 20 years ago. Now I feel old. I had a little red phone booth on my keychain after my trip to London, and some guy saw it and said, "Nice Tardis." I was impressed that he knew what a Tardis is, but not that he didn't know it would be BLUE. I found your blog through Little Purl of the Orient, and I'm really enjoying it! The whole series wasted too much time with Rose snivelling and crying 'Im not going without the docta!'. Ecclestone's Dr was the best and the empty boy the best episode because (1) i was scared and (2) i cried. And I'm 43. PS Love the Japanese crafting. I winged the pattern and will post up some handy hints and tips next week. The biggest tip being - don't think to yourself ' I really ought to move that cup of coffee before I knock it over my sewing stuff ' and then not bothering to do so. I quite agree! Christopher Ecclestone was a very hard act to follow, I think that David Tennant has done a great job!